At the age of 53, I was asked to speak at Calgary’s first Women and Wellness conference. Out of 310 women in attendance, 210 attended my breakout session. Women cried. Women laughed. At the end, they all stood clapping. One threw herself into the aisle yelling, “Let’s sing to her! And they sang “For She’s a Jolly Good Fellow”. These women told me their morale was lifted while gaining self-improvement strategies. I felt stunned and I thought, “Wow! You can turn on this many people’s light bulbs on at once!” It was on that stage when I realized my passion and my experience could make a significant impact. I have been speaking ever since, sharing myself and my stories, reducing stress and increasing joy, one laugh at a time. My research and insights on resiliency have benefited many individuals and organizations such as Shell Canada Ltd, Husky Oil, City of Calgary, and Mastercard; provincial and federal governments; education and health associations; non-profit agencies; and communities such as Slave Lake, after the 2011 fires, and Okotoks after the 2013 flooding. Along with professional speaking, my other passion is writing. I have authored hundreds of blog posts and articles; and published eight books. My latest book is From Woe to WOW: How Resilient Women Succeed at Work. With my daughter, Kelly, I wrote the award-winning book Love Her as She Is: Lessons from a Daughter Stolen by Addictions. It is the true story about the power of unconditional love in our relationship and includes fourteen ‘lessons learned’ to achieve a strong mother/daughter bond. Love Her as She Is has been featured on national radio and television, and was made into a documentary. All of my books are available for purchase online or at in-person events. Please contact me about discount pricing for quantity orders of these publications for your next event or see details in the Store. My inspirations, stories, and solutions are developed from solid research and extensive training in the field of Humanistic Psychology, Positive Psychology, and resiliency. Also, of value are my experiences as a therapist, group facilitator, agency director, and family and community member. As a Canadian speaker, I truly feel honored to help people cope with challenges, strengthen their resilience and celebrate their accomplishments. When I’m not in front of an audience, I am busy honing my craft and engaging with fellow speakers. I am a past president of the Canadian Association of Professional Speakers, Calgary Chapter and was delighted to be a recipient of the Spirit of CAPS award in recognition of my contributions to the Canadian speaking profession. That contribution was the creation and mentoring of the Fast Track for emerging professional speakers. I was also honored by Global TV and the Calgary YWCA as a Woman of Vision for the positive message and impact of my book Love Her as She Is. On a personal note, I am a spunky senior, mother of three (one with disabilities), grandmother to five (two with disabilities), and happily married . . . most days! 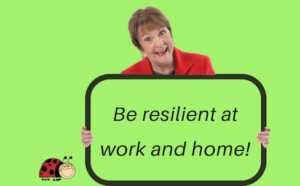 Please contact me if you are interested in an upbeat, energetic presenter who will show you how to strengthen personal and everyday resilience at work and home. 403-242-7796 or email.Please, if you would merely like to chat, that is fine. Call or email. OK?